Very sensitive, wide-field observations with a worldwide network of radio telescopes have uncovered supermassive black holes residing in the center of dust obscured galaxies. In some cases, the amount of dust is so large that even x-rays from the accreting black holes are absorbed in these systems. This is the result of research done by astronomers Chi, Barthel and Garrett from Groningen and Dwingeloo, and is set to appear in an upcoming issue of Astronomy & Astrophysics. Also in apparently normal galaxies, it seems black holes grow steadily by devouring matter. The bright, exotic radiation, usually the result of these so-called accretion processes, seems to be completely obscured in some galaxies. Only a network of highly sensitive radio telescopes can detect these processes is the conclusion of the Dutch astronomers. The suspicion that the faint radio waves, emitted by many galaxies in the distant early Universe is the result of accretion by their black holes, has now been proven. Traditional radio telescopes, such as the Westerbork Synthesis Radio Telescope (WSRT), cannot determine the exact nature of the radio emission. 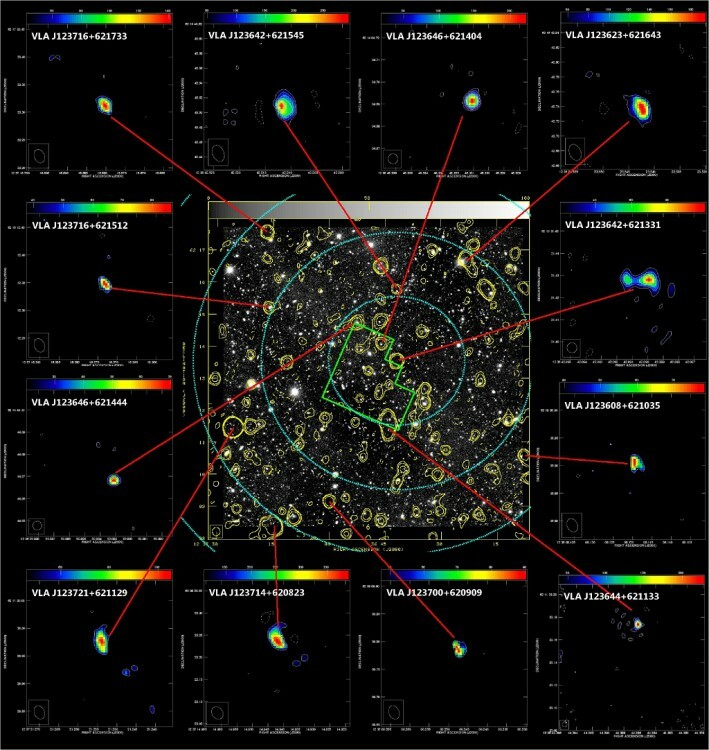 The technique of Very Long Baseline Interferometry (VLBI) is necessary, in which a network of radio telescopes in different countries or continents observe the same object. The many gigabytes of data of the individual telescopes are then combined. This method digitally simulates a radio telescope of thousands of kilometers in diameter, and as a consequence with a very high resolution and sensitivity. Using such a VLBI-network of sixteen radio telescopes on two continents (Europe and the United States), a so far unimaginable record sensitivity and resolution could be reached, undoubtedly proving the accretion activity of the distant galaxies. 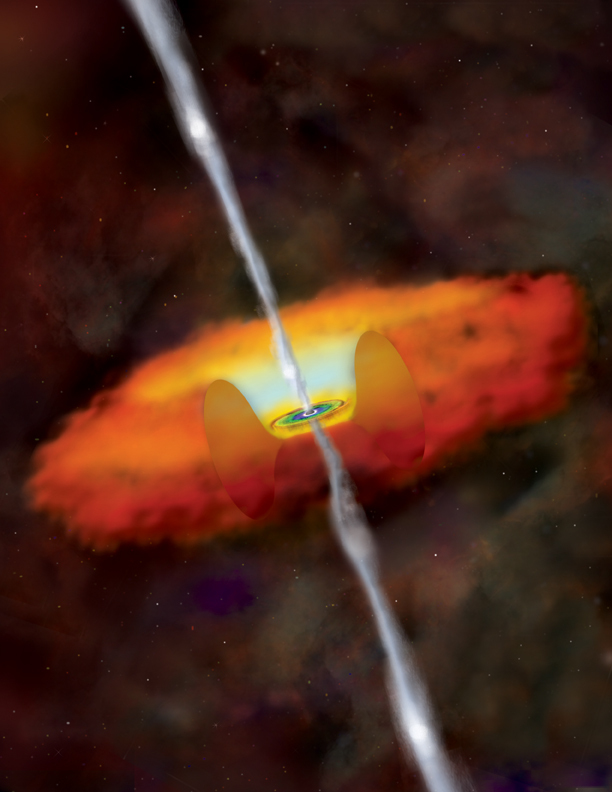 ‘We know many galaxies have black holes. Of course these need to grow to what they are now and it seems that, thanks to these VLBI-observations of the galaxies in the Northern Hubble Deep Field, we can now really observe this growth’, say prof. Peter Barthel of the Kapteyn Institute of the University of Gronignen and prof. Michael Garrett of ASTRON, the Netherlands Institute for Radio Astronomy in Dwingeloo. Barthel adds: ‘We are proud of these results, but what is mostly in our minds is the fact that the one who had the largest part in this study is no longer with us.’ Doctoral student Seungyoup Chi, from South-Korea, died from a serious illness in the year he would obtain his PhD doctorate in Groningen. ‘This publication appears posthumous, also in his memory’, say Barthel and Garrett, at the time supervisors of Chi. The publication “Deep, wide-field, global VLBI observations of the Hubble Deep Field-North and the Hubble Flanking Fields” by S. Chi, P.D. Barthel and M.A. Garrett is published beginning 2013 in Astronomy & Astrophysics.